Intertex Textiles is a molten metal safety clothing manufacturer in Canada. 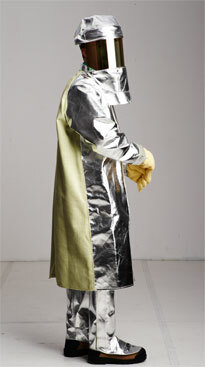 As a molten metal safety clothing manufacturer, Intertex offers head to toe protection from molten metal, ambient heat, radiant heat, & heavy slag & sparks.. Our aluminized safety clothing is designed to protect workers from high heat situations such as those found in foundries, metal casting, die casting, scrap metal recycling, mining, and smelting operations. Intertex is a manufacturer of aluminized safety clothing in Canada. Our aluminized safety clothing includes aluminized safety jackets, as well as aluminized coats, hoods, gloves and mitts, leggings & spats. Intertex is also a Canadian manufacturer of aluminized chaps & over-boots. Face protection includes gold heat reflective polycarbonate face shields & safety hard hats. Our high heat clothing is designed to protect workers from heat exposure and molten metal charges. Our aluminized clothing protects from the heat, and keeps workers cool. One such innovation is our line of Cool Coats. Our Cool Coats are made of Norfab Aluminized Carbon Kevlar™ (ACK) in the front of the coat, and plain Carbon Kevlar™ fabric in the rear of the coat. The Cool Coat protects from direct radiant heat in the front, but also is able to offer decreased weight and breathability in the rear from the non-aluminized plain carbon Kevlar™ fabric. Intertex is a Canadian manufacturer of Cool Coats. Intertex manufactures quality high heat clothing in Canada, as well as heat reflective clothing. All of our Molten Metal Safety clothing is designed to protect personnel from heat, to be comfortable, and provide durability in the harshest of industrial applications. Kevlar™ & Teflon™ are registered trademarks or trademarks of E. I. du Pont de Nemours and Company or its affiliates.